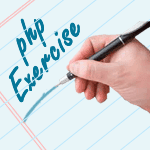 Write a PHP script to get the PHP version and configuration information. Note: phpinfo() outputs a large amount of information about the current state of PHP. This includes information about PHP compilation options and extensions, the PHP version, server information and environment, the PHP environment, OS version information, paths, master and local values of configuration options, HTTP headers, and the PHP License. Next: Write a PHP script to display the following strings.